The Tet Offensive was one of the largest military campaigns of the Vietnam War held by North Vietnamese Army (NVA) and the Viet Cong (National Liberation Front) against South Vietnam, the United States and their allies. The campaign consisting of multiple surprise attacks was launched in the early morning of January 30, 1968 – the first day of Tet (Lunar New Year) in South Vietnam. At the end of 1967, after three years of direct intervention in Vietnam, the U.S. was still stuck in a stalemate against the Communist forces. The U.S. Army did not make any noticeable progress on dealing with the Communist guerilla tactics, and there was little sign that the U.S.-backed South Vietnamese government could be able to fight against the North communists themselves. 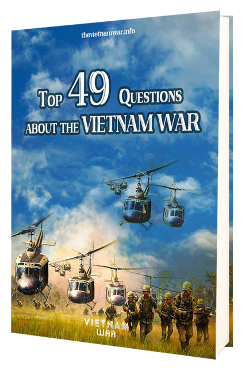 As the war was escalated, American public kept raising more and more questions about its involvement in Vietnam. According to the Gallup polls, the percentage of Americans who believed that the U.S. had made a mistake by sending troops to Vietnam had risen from 25% in 1965 to 45% in December 1967. To calm the public down, many government officials and military Generals began to speak confident words about Vietnam. Vice President Humphrey asserted that the U.S. was “beginning to win the struggle” while General Westmoreland reported that the end of the war “began to come into view”. General Bruce Palmer, Jr. went even further and claimed that “the Vietcong has been defeated.” But nothing could be further from the truth. In the fall of 1967, the North Vietnamese Army began to conducted a series of attacks on American garrisons in the central of Vietnam, near Laos and Cambodia borders. On January 21, 1968, the NVA launched a massive bombardment to the marine stronghold at Khe Sanh. To avoid another “Dien Bien Phu”, General Westmoreland began to focus more efforts on strengthening the region. However, that seemed like a trap set up by the NVA. The more forces transferred to Khe Sanh, the less alert the troops in other South Vietnamese cities became. Seizing the opportunity, in the early morning of January 30th 1968, the NVA and Viet Cong launched a massive offensive throughout South Vietnam, which was later widely known as the Tet Offensive. In the next morning after the first attacks, around 80,000 communists soldiers spread all over South Vietnam. More than 100 towns and cities, including 36 provincial capitals, five autonomous cities, 72 district towns were under attack. Most attacks targeted government building and military bases. Despite initial surprise from both the U.S. and South Vietnamese Army as there was a prior Tet Truce during the Tet celebration, they quickly reacted and inflicted massive casualties on their enemy. In most of the places, local militia and ARVN forces held the defence, the communists were driven out within two or three days. However, in some other cities such as Saigon, Kon Tum, Can Tho, Ben Tre, fierce battles continued for days. The Battle of Hue, also known as the Siege of Hue, began on January 30 and became one of the longest and bloodiest battles during the Tet Offensive and the whole war in general. At the time of the offensive, Hue was so poorly defended and fortified that the NVA forces was able to occupy most of the city quickly. The 800th and 802nd Battalions and the VC 12th Sapper Battalion began their assaults on the Western Gate of the old Citadel. 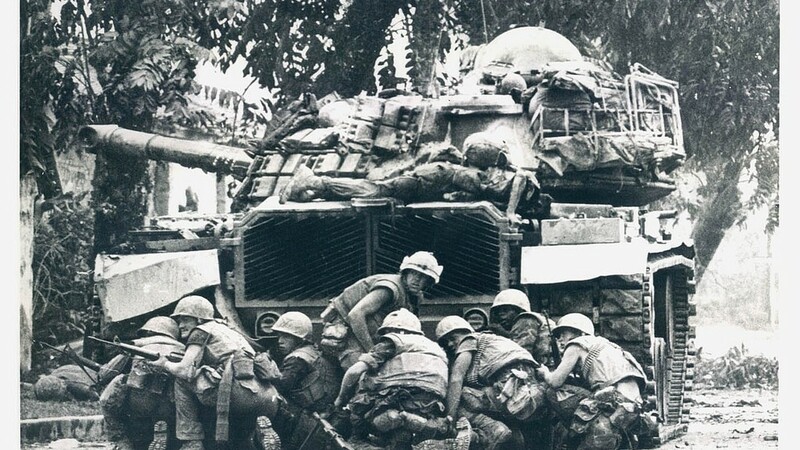 Meanwhile, the 4th NVA Regiment attacked the U.S. MACV located on the south of the Perfume River. Nonetheless, the U.S. forces and ARVN began to counter-attack almost immediately. The 2nd, 7th and 9th Airborne Battalions reached the headquarters of the ARVN 1st Division in the Citadel’s northeast corner on evening, 31 January. On the next day, the ARVN began to retake all the northern banks of the river. In the south, the U.S. forces, reinforced by the 2nd Battalion of 5th Marine Regiment, began to fight house by house against the NVA. By February 9, the southern banks had been cleared. However, fighting still continued in the Citadel. By 29 February, the Black Panther Company of the 1st ARVN Division finally retook the Imperial Place in the center of the Citadel and torn down the NVA’s flag. The city of Hue was held for nearly a month by the NVA. During this time, several thousands of civilians who had cooperated with the U.S. and the ARVN were executed by the Vietcong. When the U.S. and ARVN forces retook the city on 26 February, 2,800 dead bodies were found and another 3,000 residents were missing. On March 3, 1968, the NVA completely retreated out of Hue. Altogether, the NVA lost about 2,400 to 8,000 troops while the ARVN and U.S. had 668 dead and 3,707 wounded in total. After the battle, over half of Hue’s buildings were completely levelled, including many temples, palaces, and other cultural & historical monuments in the citadel where most of the toughest fighting took place. As the conflict occurred across the country, many other towns and villages suffered terrible devastation and 627,000 South Vietnamese people were displaced. Tet Offensive’s first phase ended in 28 March 1968 while the second and third phase took place and ended in May (May Offensive) and August respectively. The Tet Offensive was widely regarded as a major turning point in the Vietnam War. Even though the offensive was a complete military defeat for communist forces with more than 111, 000 casualties in which one third of its troops were killed in action, many North Vietnamese leaders saw it as a political and “psychological” victory. First, the offensive inflicted high casualties on American forces all of a sudden. 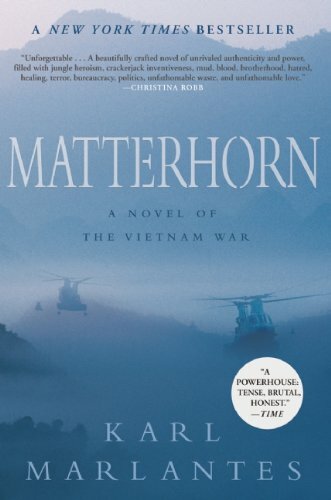 Second and more importantly, it shocked the American public and left a profound impact on its government since the Tet proved that Hanoi was capable of launching such a massive military effort and the war still had a long way to the end, which was totally opposite to what their leaders had told them. The communist psychological victory was illustrated by the vast numbers of American people who changed their views about the war after Tet. According to the Gallup Poll, public support for the Johnson’s war effort in Vietnam plummeted from 50% in 1967 to as low as 26% right after the offensive. Anti-war protests increased dramatically and took place on a larger scale. Under dramatic plunge in support, President Johnson halted the bombing campaign against North Vietnam so as to start peace talks with them, and at the same time, withdrew from the 1968 presidential election. In South Vietnam, General W. Abrams replaced General Westmoreland, whose request for for 206,000 more troops had been rejected, as the commander of MAAG Vietnam. The U.S. began to find a way out of Vietnam and now the job of de-escalating American participation in the war was left to the next President, Richard Nixon.